This year’s Art Deco Weekend poster was created by Philip Brooker, an artist based in Key Biscayne, FL who works in several media and styles — in addition to painting, he frequently incorporates photographs, found objects, and words into his work. He also makes furniture and is a prolific illustrator. Brooker is art director of the Miami Herald, and was for many years art director of Tropic, the Herald’s Sunday magazine. Brooker’s illustrations have appeared in many print publications and advertising campaigns. His clients include Random House, the Washington Post, the Los Angeles Times, Entertainment Weekly, CNN, Time Warner, and many others. For the past several years he has been exploring ways to incorporate photography into his fine art. He tends to work in series, most of which are inspired by words and are concerned with recording and exploring moments in history. Currently a major focus is a series inspired by letters from World War I soldiers. Brooker’s fine art has been exhibited worldwide, including shows at the New Lane Gallery and the Leeds Museum of Art in England; Hochman Jacobson Gallery, the Drawing Center, and the Holly Solomon Gallery in New York; and Galerie Climate in Paris. For more information, visit his websites at www.anicecupoft.com (illustrations and furniture) and www.philipbrooker.com(fine art). 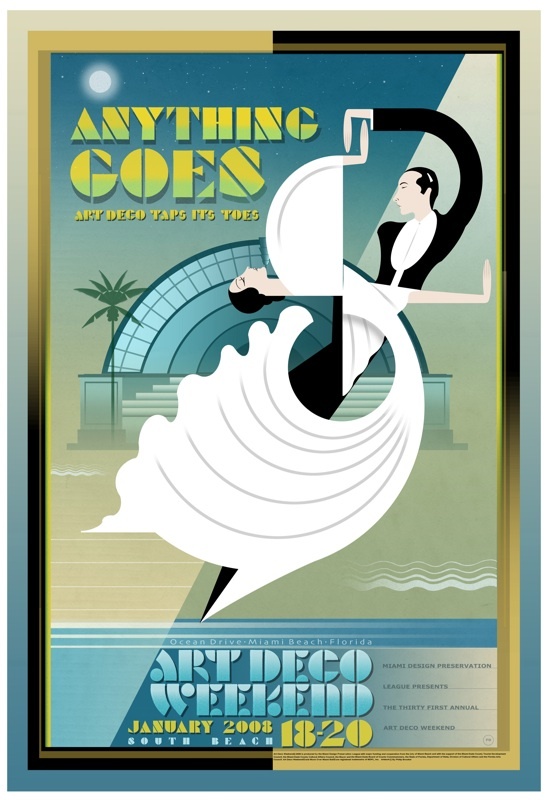 Philip Brooker will sign posters during Art Deco Weekend at the Art Deco Weekend Booth, located at 10th Street and Ocean Drive. The poster is available online and from the MDPL Art Deco Gift Shop, as are t-shirts, tote bags, and decorative wall tiles with the poster image. This entry was posted on Monday, December 24th, 2007 at 3:42 pm	and is filed under Arts, Entertainment, Music. You can follow any responses to this entry through the RSS 2.0 feed. Both comments and pings are currently closed.